Why did Activision take an already expensive game and release an even MORE expensive version without adding a whole lot to it? And what does it have to do with “Ozark wild mushrooms served with a brandy demi glaze?” I’ve got an idea. Let me share it with you. They’re stupid? Nope. 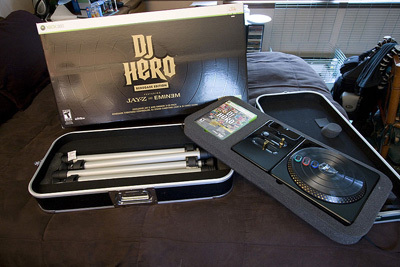 According to one recent press release, DJ Hero was 2009’s highest grossing new video game IP. So something worked. 2 At the very least, the Renegade Edition pricing is an example of what economists call “price targeting” and what author Tim Harford likens to getting turkeys to vote in favor of thanksgiving. 3 In essence, Activision is putting the Renegade Edition out there so that people who are cavalier about price self-identify themselves and allow themselves to be sold basically the same product for more money. It’s the same trick restaurants use to find patrons willing to pay more for food when they charge an extra $.80 for a slice of cheese on your burger when it really only costs them a few cents. But I don’t think that’s the whole story. I think there’s something called “the contrast effect” at work, and I think Eminim and Jay-Z would be appalled. Which circle is lighter? Trick question! They're the same. This is why I think the Renegade Edition of DJ Hero was put out there: to activate the contrast effect and to make the regular, $120 edition look cheaper in comparison. Man, $200 for a video game? Forget that. I’m gonna be a the smart shopper and only buy the $120 version. What restraint I have! Quick! Somebody congratulate me! Those “Ozark wild mushrooms served with a brandy demi glaze” may be the most expensive side dish listed, but the restaurant only listed them first so that the cheaper mashed potatoes, which have a higher profit margin, look more appealing. If you’re like me, you see attempts at the anchoring effect everywhere once you know about it. Now that you know about it, think back on the last time you saw a regular version of a game advertised next to the collector’s edition. Does the regular one seem so cheap now? 3. Harford, T. (2006). The Undercover Economist. Oxford: University Press. first of all,very nice site.blog you have here,love it! and i agree,thats is the reason why i opted to buy a 16 gig 3gs iphone instead of 32 gig!you articles are spot on! Thanks, and yeah Apple is a great example of someone who uses this all the time. Many of their products have 3 tiers, and I bet that the middle tier is always the best seller. I think Modern Warfare 2 is an even better example, as they had 3 editions, thus a middle tier. I wonder if they sold more of the higher margin mid range version due to the existence of a super high end ‘prestige’ edition. I’ve been checking this blog regularly since I’ve first read about it on Joystiq and I really can’t explain how informative and enlightening your posts are. But isn’t it strange for someone to go for the “middle/most profitable for the seller” option, even if they know they are being “played”? Sometimes, the joy you get out of the slight upgrade can make the price look logical, or is it just an illusion? Yeah, but what I think makes this work so well with DJ Hero is that people’s price expectations aren’t anchored on the $60 price point. Usually that’s what people contrast against for CEs and such, but it’s not applicable to this thing. Thanks, glad you’re digging it! The thing about humans is that we all assign subjective values to things, so yeah, maybe paying a little more for a bigger screen or getting your gadget in black yields enough pleasure to make the extra money worth it. This is what drives economists crazy. I always knew this as the Goldilocks effect. One product priced too high, one priced too low (therefore it must be an awful product by default) and one priced moderately in the middle with the other two making it look more reasonable. Apple seem to do this a lot. Yours is a good point well made though! Yeah, that’s a related phenomenon. I’ve heard it called the compromise bias, too. A very fun (i.e. dastardly) manipulation of this effect can be seen at many gas pumps. Totally illogical, but i bet it catches a ton of people. They also do that to get you to anchor your price perception on the high end so that the middle and lower grade gasses seem cheaper. Same reason why some fast food restaurants list their drinks in order of descending price/size. Dan Ariely discusses the anchoring effect in pricing quite well in “Predictably Irrational”. I’m really curious when the last time you updated this was? Thanks.